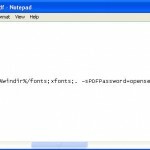 Are you looking for a way to remove password restrictions on a PDF that you own? Here we list five free sites to remove PDF password online. Most of these sites have a friendly interface and it is easy for any user, irrespective of his skills in using a computer, to upload the PDF document and remove the password. PDF is a very popular document format and it is widely used because it supports most platforms i.e. it can be used on Windows, Mac, Linux or any other OS and it also looks the same on all the platforms. Moreover, PDF Reader is also available for free download which makes it easy for any user to open any PDF document for which he has appropriate permissions. PDF Reader is similar to the free word viewer and it has limited functionality. While a word viewer can be used to open and read Microsoft Office word documents, a PDF reader can be used to open and read PDF documents.However, unlike word viewer which is available only for windows OS, PDF reader is available for several operating systems. PDF also offers better protection to the document creator as it can be secured with appropriate passwords. You can read this guide to find out how to password protect PDF documents. There are basically two kinds of passwords that can be set on a PDF document. These are “Owner Password” and “User Password”. “Owner Password” imposes restrictions in carrying out certain actions on the PDF document. The following are a few actions that can be restricted with a owner password. “Owner Password” is also sometimes referred to as “Master Password” or “Permissions Password”. This password is set to prevent any user from carrying out any of the above actions, unless he knows the Owner password. Unlike “Owner Password”, “User Password” imposes restrictions on opening the PDF document. This is to ensure that the PDF document is not misused by persons who are not entitle to open the document. Thus, a PDF document on which a “user Password” has been set can only be opened by persons with whom such password has been shared and not by anyone else. Most free PDF password remover tools will let you to remove owner password. This is true for even the following online PDF password removers. Many of these sites will also work only on documents encrypted using the standard encryption. However, these free PDF unlocker sites will not work on any PDF document on which a third party encryption tool like DRM has been used. Using these online tools is simple. All you need to do is go to these online applications and upload the PDF document to remove its password.